Candidates who are looking for the Teaching Jobs 2019 can check this page. This article gives you the complete information regarding the latest Teaching Vacancies 2019. As we all know that the Teaching profession is one of the most respectable jobs. The candidates who are willing to make their career in the Teaching filed can apply for the Government Teacher Jobs 2019. Contenders can apply various vacancies such as PRT, Pre-Primary Teacher, Secondary Teacher, Elementary Teacher, PGT, TGT, Senior Secondary Teacher, Professor, Assistant Professor, Associate Professor. We have updated the Government and Private Teacher Jobs in the next section. Along with this, the aspirants can also get the state wise Teacher Job Openings 2019 in an understandable manner. By scrolling down this page the candidates can check the entire details without any issues. Here through this article, candidates can check the Latest Govt Teacher Job. You will also find out the Latest Vacancies for B.Ed Teachers, Teaching Jobs in Govt Schools on Contract Basis. Well, you can also find out the Teacher Job Vacancy for Freshers. We update all the Latest Teaching Jobs Notification on daily basis. Through this article, you will find the Regular Teaching Jobs in India. Every year lakhs of candidates are showing interest in Teaching Jobs 2019. Job seekers who are looking for the Teaching Jobs on the internet can stop searching. This page is created to provide the latest and upcoming Teaching Job Openings 2019 across India. Contenders who want to career bright in the teaching filed can go through this page thoroughly. In a year various schools, colleges, universities are releasing the employment notifications for the Teacher vacancies. Both the freshers and experienced candidates can check the latest Teacher Vacancies from this article and apply for it. To get the Teacher job the candidates have to give the test first. The main test to secure the Teaching Job is CTET and TET. If you are seriously trying to get the job in the Government Schools the candidates have to clear the Teacher Eligibility Test first. The candidates who clear the Teacher Eligibility Test can do as the teacher for the primary classes and secondary classes. Both the Central Governments and State Governments in India will conduct the TET Test. Mostly every state will conduct their own Teacher Eligibility Test to hire the skilled and talented aspirants for the teacher positions. The Central Body of Secondary Education (CBSE) will conduct the Central Teacher Eligibility Test (CTET). To clear this test the candidates have to acquire a minimum of 60% marks in the test. Those who got minimum marks can apply for the vacancies in the Central Government Teaching Jobs. Some of the organizations such as KVS, NVS, AEWS are under the Central government jobs. There are several routes in the Teaching. The candidates can choose their own depending upon their interest. The candidates who are applying for the Pre-Primary Teacher Jobs have to possess Diploma ((ECCE)/NTT) or equivalent. For the Elementary Teaching Jobs, the eligibility is Diploma in ETE/ D.Ed/ BTC. Contender of BA/ B.Com/ B.Sc has to do B.Ed to get the teacher job as the Secondary Teacher Jobs. To apply for Senior Secondary Teacher Jobs aspirants have to do B.Ed after MA/M.Com./MSc./equivalents. To apply for the higher education jobs the candidates have to possess Ph.D., NET, SLET from any college/ University/ Institute. Candidates can also check the Government Jobs In India from our website. The Educational Qualification for the Teacher for Technical Level/ Professional is given here. Many of the candidates who complete B.E/BTech/ M.E./MTech./Ph.D, B.Lib.Sc/M.Lib.Sc./ M.Lib.Sc and UGC NET can apply for Central Government Teaching Jobs 2019 through our website. Most of the candidates are not able to find out the exact link to apply for various Teaching Jobs 2019. In order to help them, we are providing the direct links on our website. Candidates can click on the link and check the details carefully. Later on, can be procced for the application process. The authorities of the organization conduct the selection process as per their norms. As per the latest information, most of the job fighters are seeking for the jobs in Teaching Sector on the various websites. To reduce the search burden on the aspirants and to save the time our team had collected the latest and upcoming Teaching Jobs 2019 from various sources and equipped here. Most of the aspirants are failed to get the genuine info regarding the teaching jobs. This page gives you the entire details like eligibility criteria, selection process, age limit, salary details etc. Coming to the age criteria the candidates should have 18 years as the minimum age limit. The Upper age limit may vary from position to position. There are a numerous number of educational institutes such as colleges, schools, universities educating the students across India. Almost in all the major cities, such as Delhi, Mumbai, Ahmedabad, Indore, Chennai, Coimbatore, Bhopal, Lucknow, Kolkata, Bangalore and some other are releasing the employment notifications for the Teaching Jobs 2019. So all the candidates who are applying are advised to check the eligibility criteria before applying. Every Government Organization will conduct the Teacher Eligibility Test first. This exam consists of two papers. Paper I consists of topics related to Classes I to V. And the Paper II comprises of topics from Class VI to VIII. To perform well in this test we are providing the Syllabus and Previous Year Questions Papers on our website. Candidates think that the teacher job is easy, but their thinking is wrong. All the candidates have to put maximum concentration and full knowledge on the particular subject. At the time of recruiting the officials will check these skills in the candidate. So be confident and clear all the rounds carefully. 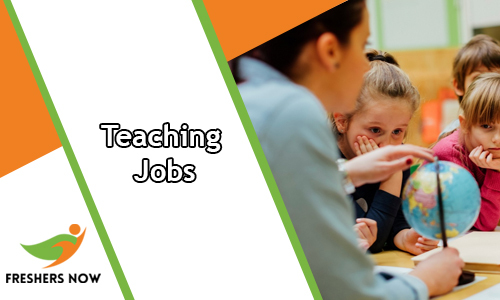 For more updates regarding the Teaching Jobs 2019 stay in connecting with our website Freshers Now on regular basis.